Kelly Pavlik (36-1, 32 KO's) returned to the ring and looked impressive, stopping Miguel Espino (20-3-1, 9 KO's) at 1:44 of the 5th round in front of his hometown fans in Youngstown, Ohio. Pavlik had not fought since February 21st, after he suffered a staph infection on his left hand. Both fighters elected to battle toe-to-toe the entire fight without taking a backward step. In the 1st round, Pavlik was landing a lot of rights and lefts to Espino's body. Pavlik was willing to stand and trade with Espino, but suffered swelling under his right eye. Espino was deducted a point from referee Steve Smoger for throwing a left hook at Pavlik after the bell had sounded. In the 2nd round, both men continued to exchange blows in close quarters. Pavlik snapped Espino's head back with a rock-solid, right uppercut after he hit Espino with a right to the body. In round three, Pavlik was dishing out and landing some pretty hard punches. Espino was tough and kept the fight in close range. Pavlik did not mind fighting inside as he delivered some effective combinations. Espino had a tendency to lean too far forward when he was battling Pavlik in close range. Pavlik made him pay for it. In the 4th round, on a delayed reaction, Espino dropped to one knee after Pavlik hammered him with a right uppercut to the head. After absorbing two more right uppercuts from Pavlik, Espino went down again. Espino showed his durability once more when Pavlik connected with a right to the body-right uppercut combination. Espino made it out of round four, but would not get out of round five. Pavlik hit Espino in the body with a ferocious left hook. Then, Pavlik nailed Espino with a series of rights and left hooks. Finally, Pavlik put Espino down for a third time when he landed another right uppercut to the head. Espino rose to his feet, but referee Steve Smoger stopped the bout. Paul Williams decided to face Sergio Martinez, as opposed to waiting for Pavlik's staph infection to properly heal and fighting him. Well, after winning a 12 round majority decision over Martinez, Williams has another chance to step in the ring with Pavlik, if he wants the fight. Pavlik vs. Williams could take place early in 2010. In a bantamweight showdown, Nehomar Cermeno (19-0, 11 KO's) remained undefeated after stopping a resilient Alejandro Valdez (22-4-2, 16 KO's) in the 11th round. A 30 year old Venezuelan, Cermeno was aggressive early, but ultimately used his boxing skills in the later rounds to come out victorious. Valdez fought hard, although he had difficulty landing combinations against Cermeno. In the 1st round, Valdez suffered a cut above his right eye, resulting from an accidental clash of heads. However, Valdez fought assertively and landed some counter lefts. Yet, in the 2nd round, Valdez did not fare so well. Cermeno floored him with a counter left hook. Valdez got up and appeared to be dazed. Then, Cermeno landed a flush right. The second knockdown occurred when Cermeno landed another right hand. Valdez showed heart and the ability to take a clean punch. In the 4th round, he hit Cermeno with some counter lefts. Valdez was still wide with his shots and did not land many in succession. A series of lefts stunned Cermeno in the 5th round and Cermeno seemed to be baffled by Valdez in the 6th round. Valdez got a surge of energy and started to attack more. Cermeno made the mistake of standing in front of Valdez too long. In the 7th round, Cermeno went back to fighting on the outside, using his lateral movement to stay away from Valdez's attack. Valdez absorbed a solid overhand right from Cermeno, but kept coming forward. With Valdez still chasing in the 8th round, Cermeno connected with a left uppercut. Then, Valdez landed a straight left, but Cermeno countered with a left hook. Heading into the 9th round, it was evident that Valdez was going to have to put his punches together, if he was going to win this fight. Cermeno kept boxing in the 10th round, but Valdez hit him with a straight left - right hook combination. Cermeno was deducted one point by the referee for using his knee in the 11th round. Next, Cermeno buckled Valdez with a big right hand. Lastly, a right uppercut-overhand right combination knocked Valdez to the canvas. The referee stopped the action at 2:40 of round eleven when Valdez could not beat the ten count. Humberto Soto (50-7-2, 32 KO's) won his sixth consecutive fight by outpointing a sturdy Jesus Chavez (44-7, 30 KO's). All three official ringside judges scored the bout 100-87 for Soto. Yet, the fight appeared to be closer. Soto floored Chavez with an overhand right in the 1st round. After the knockdown, Chavez tried to work his way inside using the jab. With his back against the ropes, Soto caught Chavez with a counter left uppercut. Chavez attempted to attack Soto's body. Soto was patient and when Chavez stopped throwing the jab, he would land right hands on his head. In the 2nd round, there was a clash of heads. Chavez seemed bothered by Soto's jab. Soto continued to hit him with right hands off his jab. Chavez was willing to take a punch to deliver one, but Soto would step back and land sharp left uppercuts that had a serious impact. Yet, Chavez kept pressing forward. Toward the end of the round, Chavez appeared to land a left hook to the body that dropped Soto. However, the referee was in a bad position and thought Soto had slipped. As Soto, went back to the corner, he appeared hurt. In the 3rd round, Soto connected with a piercing left uppercut as Chavez charged forward recklessly. Chavez got Soto on the ropes and landed a solid right to the body in round four. Then, Soto landed another left uppercut and followed it with a double left hook to the body that slowed Chavez's attack. Chavez continued to take a punch to deliver his own. In round five, both fighters exchanged blows in the middle of the ring. Soto hit Chavez with a hard body shot. Next, he started to catch Chavez with right hand leads. Chavez was deducted a point for throwing Soto through the ropes. When the action continued, Chavez tagged Soto with a left hook to the head. In round six, Chavez hit Soto with a left hook that was below the belt line. Soto was down for a about a minute. Subsequently, when Soto got back up, he exchanged bombs with Chavez. Soto nailed Chavez with a flush right uppercut and followed it with an overhand right. 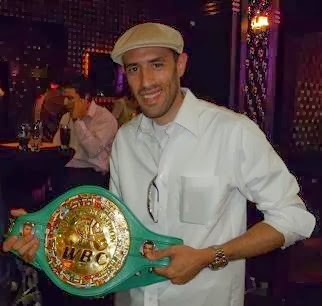 Chavez backed Soto up in the 7th round when he connected with a right - left hook combination. As Soto moved back, he unleashed a sharp right that hit Chavez. The 8th round had continuous action. First, Chavez struck Soto with a left hook to the body. Soto countered with a right to the head. Next, Soto landed a left uppercut-overhand right combination. Then, Soto nailed Chavez with punishing right hands. Chavez attempted to work the body, but Soto stepped back and landed an uppercut. Soto nailed Chavez with a another right just before the end of the round. In round nine, Chavez was still coming at Soto strong, but Soto continued to land left uppercuts and right hands. Soto boxed more in the tenth round and used his jab, while moving laterally around the ring. Both fighters connected with right hand leads. With 30 seconds to go in the bout, Soto made an effort to knock Chavez out by throwing a series of right hands, but he was unsuccessful. Chavez weathered the storm, although he lost the decision. In a featherweight bout, 22 year old Miguel Angel Garcia remained unbeaten (18-0, 15 KO's) after stopping Yogli Herrera (22-11, 15 KO's) in the 3rd round. Garcia connected with a clean left hook early in a slow paced first round. Garcia was the aggressor and was seeking to land combinations. In round two, Herrera was moving a lot and connected with a left hook. Garcia was jabbing, but not hitting Herrera with much after it. When Herrera backed into the ropes, Garcia landed a left hook - right hand combination. Garcia nailed Herrera with a solid left hook to the body in the 3rd round. Then, Garcia threw and landed another left hook that floored Herrera. After Herrera got to his feet, he was standing in the corner. Garcia moved in and hit Herrera with a left hook to the body and followed it with an overhand right to the head. A left jab-right hand combination sent Herrera down again. The referee stopped the bout. In a junior middleweight clash, Vanes "The Nightmare" Martirosyan (26-0, 17 KO's) remained undefeated with a 3rd round TKO victory over William Lee (17-6, 11 KO's). Martirosyan connected with left hooks and a right uppercut early in the 1st round. Martirosyan was very selective with his punch output. A southpaw, Lee was stunned by a big right hand. Lee absorbed some serious rights and left hooks, but still pressed forward on wobbly legs. As the round came to a close, Lee caught Martirosyan with a straight left. In the 2nd round, Martirosyan continued to hit Lee with effective right hands. Lee jabbed and tried to force Martirosyan back. Next, Martirosyan was successful when he landed a series of rights to the body. Then, Martirosyan floored Lee with a solid right to the head after he previously knocked Lee's mouthpiece out with a right hand. When Lee got up, Martirosyan blistered him with a series of rights and left hooks. After that, Martirosyan sent Lee down again when he landed a hard right hand to Lee's head. Time of the stoppage was 2:13 of round three. Martirosyan has been boxing since he was 12 years old. As an amateur, he represented the United States at the 2004 Olympics as a welterweight, but lost to Cuba's Lorenzo Aragon Armenteros. He is trained by Freddie Roach and is moving up the junior middleweight ranks quickly. In other action on Top Rank's card: Samuel Peter (TKO 4) over Gabe Brown, Omar Henry (TKO 1) over Jessie Davis and Matt Korobov (TKO 3) over Ken Dunham. Good posting. I like it. It's pretty much impressive.